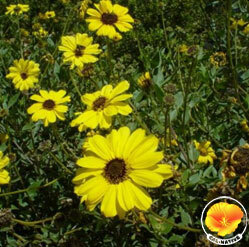 Encelia californica is a fast growing woody subshrub with bright green foliage and yellow daisy-type flowers. Can be used effectively in the natural landscape with regular pruning to maintain form. More commonly used in restoration. In inland situations requires more regular water. Grows to 3-5'H x 3-5'W.